What Is the Differences Between Testamentary and Living Trusts? What Is the Difference Between Testamentary and Living Trusts? The basic difference between a testamentary trust and a living trust is pretty black and white. Each is really just what it sounds like. A testamentary trust is one that's provided for in a last will and testament; the will tells the executor of the estate to create it. A living trust is set up by someone while he's alive. Although the will is drafted while its creator is alive, the trust itself doesn't come into existence until the will is probated and the executor settles his estate, and this can't happen until his death. The trust, therefore, isn't "living." A testamentary trust is sometimes called a "will trust," or a "trust under will." Beyond this basic distinction, however, it can get a bit complicated. A testamentary trust doesn't necessarily have to be established by the terms of your last will and testament. Maybe you don't have a will; you have a living trust instead. 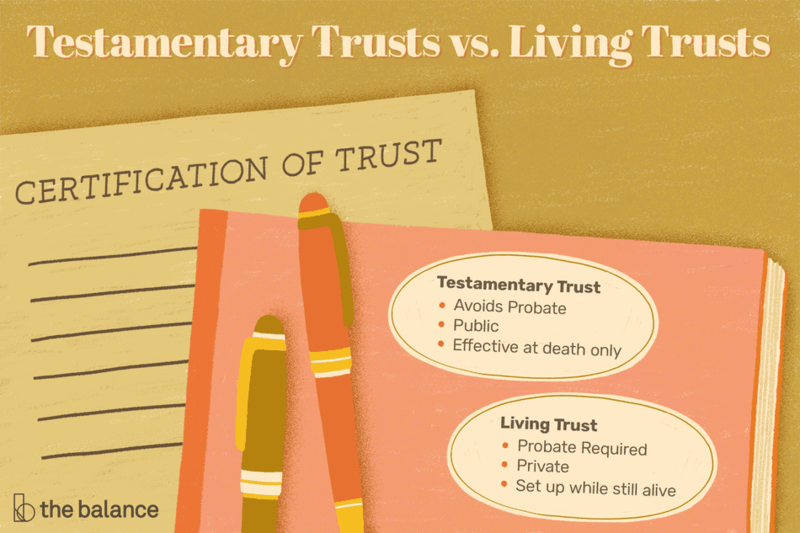 You can direct that your living trust should create a testamentary trust, too. You could effectively have both types of trusts if the terms of your living trust's formation documents say that yet another trust is to be formed from the assets it holds when you die. There are almost as many types of living trusts, also called "inter vivos" trusts, as there are reasons to create them. One might be designed to hold just a decedent's life insurance policy. Another might be set up to keep the funds out of the hands of a beneficiary's creditors. Some trusts specifically address beneficiaries with special needs. But all these trusts fall into one of two categories: They're either revocable or irrevocable. A revocable living trust is one where its creator--called the "grantor" or "trustmaker"--can dissolve it at any time. He/she can add beneficiaries, delete beneficiaries, and buy and sell assets from the trust. A grantor typically acts as his/her own trustee. An irrevocable living trust is just the opposite. The grantor relinquishes all control over the trust after it is created and funded with property and/or money. This can be preferable for tax purposes and other reasons. He/she cannot legally act as trustee, and he/she can never take his/her property or money back unless he/she names himself/herself as a beneficiary and sets terms for distributions to himself/herself as part of the trust's formation documents. A revocable living trust automatically becomes irrevocable when its grantor dies because he/she is no longer alive and available to amend it or dissolve it. A testamentary trust is revocable during the testator's lifetime because it doesn't actually exist yet. It won't come into being until after his/her death. He/she reserves the right to tear up his/her old will and make a new one at any time while he/she is alive, so the testamentary trust it provides for can be undone as well. The trust becomes irrevocable, however, when he/she dies and is no longer able to change the terms of his/her will. Living trusts -- both revocable and irrevocable -- avoid probate of the property they hold because the trust entity and not the decedent technically owns that property. Probate is only necessary to move ownership from the name of an individual who is deceased to those of his/her living beneficiaries. A testamentary trust can't avoid probate because the property to be transferred into it remains in the decedent's name at the time of his/her death -- the trust hasn't been formed and funded yet. Probate is necessary to move that property into the name of the trust, just as it would be to transfer it into the names of living beneficiaries.